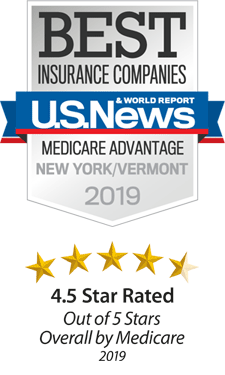 Schenectady, N.Y., November 13, 2018—MVP Health Care has been named a Best Insurance Company for Medicare Advantage 2019 in New York State and Vermont by U.S. News & World Report, earning a rating of 4.5 stars out of a possible five stars. MVP is one of only three insurance companies in New York and the only one in Vermont to receive such a high ranking for 2019. MVP insures 61,000 Medicare beneficiaries in New York and Vermont and is among the top performing health insurance companies listed by U.S. News as consistently offering highly rated Medicare Advantage plans in multiple states. The ratings are a resource for Medicare beneficiaries and their families searching for the best coverage options during the annual enrollment period for Medicare plans, which began October 15 and runs through December 7, 2018. U.S. News used plan ratings data from the Centers for Medicare & Medicaid Services (CMS) to identify the Best Medicare Advantage Plans. CMS rates individual plans on a scale of 1 to 5 stars, factoring in member satisfaction, customer service and other criteria. The methodology analyzes all plans offered by an insurer in a given state. For an insurer to make the U.S. News list, eligible Medicare Advantage plans had to earn an average rating of at least 4.5 out of 5 stars. GoldSecure with Part D (HMO-POS), Preferred Gold with and without Part D (HMO-POS), Gold PPO with Part D (PPO), and WellSelect with Part D (PPO). MVP Health Care is one of the largest Medicare Advantage providers in the state of New York. Plans are available in the Buffalo, Rochester, Syracuse, Utica, Binghamton, Albany, Hudson Valley and Westchester markets, as well as all of Vermont. For more information about MVP’s Medicare Advantage plans, visit joinmvpmedicare.com.